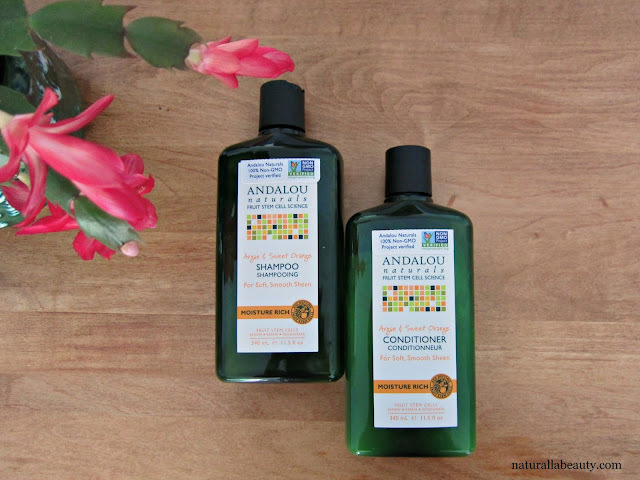 Andalou Naturals is one of my favorite brands for affordable skincare, but I haven't branched out much into their hair products. A couple months ago, I finally took the plunge when I found the Argan & Sweet Orange Shampoo and Conditioner on sale at a local health food store. The bottles had tear-off coupons attached, which combined with the already discounted prices, brought these down to $5.99 each. Healthy hair care doesn't often come that cheap - especially here in Canada, land of the eternal price markup - so I was quick to take advantage of such a great deal! The Argan & Sweet Orange line is Andalou's moisturizing hair range, specifically targeted at curly, dry, and color-treated hair. According to the bottles, sweet orange revitalizes hair follicles and encourages healthy circulation, while argan oil minimizes frizz, adds luster, and nourishes hair, restoring moisture, elasticity and strength. The shampoo has a thick gel consistency and lathers up really nicely. It's great at getting rid of product buildup and thoroughly cleans the scalp without drying out or stripping hair. The conditioner is also very thick in texture, though not as ultra-rich or moisturizing as such a thick consistency might initially suggest. It does a good job softening and detangling hair, but it doesn't tame frizz or flyaways very well unless I use a copious amount of product. A generous application does a fine job controlling frizz and gives decent curl definition, but I feel like I'm burning through the bottle very quickly. I may try the Argan Oil Plus+ Deep Conditioner next time, as I'm curious if it would suit my curly hair needs better. Both products have a candy-like orange scent. It's very sweet, but not cloying or sickly. The smell also lingers in the hair, so if you're someone that misses that residual scent left behind from conventional hair products, these might be just the thing. I catch whiffs of the sweet orange scent right up until my next wash.
A good option if you're looking for inexpensive and easily accessible hair products. Despite the marketing, curly or extra dry hair types may not find the conditioner hydrating enough, but I think it would suit just about everyone else.